On Friday I was delighted to get happy mail from Paper Crafts that one of my cards was picked up for the Holiday Cards and More Volume 7!! It was a busy day for me and when I came home from picking up Ariel to that email it made it so much better! :> When I created for that call I was supposed to be studying for my test. But breaks are part of good studying (right?) I was happy that a card got picked up and that I aced my test! We had a great weekend. On Thursday my Mother in law asked me if she could take the kids to the cabin for the night on Friday. Ummm....of course! She took the "little" grandkids all 5 of them and barely fit them in the van! Chad and I enjoyed some time together and went for dinner! :> I was looking forward to sleeping in but sadly could not! :< On Saturday instead of crafting or reading a book you know some me time I spent a lot of time organizing the kids toys. And I enjoyed it. I also cleaned up and organized quite a bit! It was nice to have that time together but the house felt sooo quiet! Saturday night we had some friends and there kids over and today I did some work with Chad! :> And we visited with my parents. My mom made ribs for dinner, she really knows the way to Chad's heart! Hello! Hope your day has been treating you well! It's been a great week over here! We have been enjoying the spring weather as a family! Today I had a good friend over with her two kids and her 6 month old son enjoyed cuddling with me and napped on me! I used the super cute set by Lawn Fawn Flying By! I actually made this card for Stamping Royalty and like the last card I share that I made for it (here) I made so many mistakes when I made this card! I kept stamping the tails badly and I probably would have given up this card had not every other piece been ready to go! I am entering this card into this weeks Simon Says Stamp Challenge which is anything goes! Yesterday we had a meet and greet with Carter's soccer team! Carter is so excited to play soccer! And we are too! We have been waiting for when he would be old enough to play soccer since he has shown so much interest and promise since he was just about 2! We also got his soccer jersey and last night when I went to check on Carter I found him sleeping in it! I didn't put him to bed in it! And than he wore it all morning changed when friends came over and than put it back on when they left! So cute! Next Friday is his first game! Well I am off to watch grey's anatomy and relax! I will be sharing some wreaths in the next bit as I have a few orders with Mother's Day coming up! My mom and Oksana's mom threw the shower at a hall, and it was a big shower around 106 women! Oksana and my brother Rob were so blessed by everyone! I actually was the MC! This was my first time being an MC and before the shower I was quite nervous! Thankfully it went really well! Everyone had kind words for me on my MC job! Even though I butchered quite a few last names!!! When Oksana opened up gifts, monetary gifts and gift cards I would say who she was opening from and what it was. I am proud to say I made them laugh with my on the stand jokes and funny antidotes that I came up with! There was an insane amount of food! My mom and Oksana's mom spent weeks hand making pergoies and baking! I found out that Oksana's mom had 1 hour of sleep the night before since she was worried there wouldn't be enough and she made more! They served a hot lunch and it was so much food with so much leftover! I am not kidding you that there was 5 rectangle tables of baking! The baking was amazing and I very much enjoyed that and took food home! My brother and his groomsmen served wine, coffee and tea! It was fun to see them work the room! The bridesmaids and me got there early to help set up. But the real stars of the show was my aunts and good family friends who came at 9:30 that morning to work in the kitchen and did so much clean up! We are so blessed by them! I am sad to say that I didn't get a chance to take too many photos. But my brother had his camera set up on a tripod and probably took 200 photos! But I got a few of Ariel and Oksana's nieces. All three of them are flower girls! At first they were shy but by the end they were dancing on the stage! Oh I wanted to share that yesterday I got back my exam results! I am happy to share that I got 85% on my 3rd real estate test! My studying paid off! :> Now I can start working! So lots of new stuff going on over here! Well I am off Ariel is almost home early from school as she has early dismissal! :> It's beautiful outside so I am planing when Carter wakes up that we go to the park! Tonight Chad and I are facilitating the Marriage Preparation course at our church my mom loves babysitting! Flowers and Mother's Day and Grey, Yellow and White Wreath! Hello Happy Thursday! Hope your day has been fabulous! I've been enjoying a much needed day at home! Sometimes you just need that right? It's so sunny outside that Carter and I went for a nice long walk and than he came home and fell asleep fast for his nap! I enjoyed some relaxing time too! Last week after teaching the Mother's Day card class I picked up a new 6 by 6 pad This and That by Echo Park as a reward for myself! :> Today I finally was able to play with it! I embossed with chestnut zing embossing powder the flowers from patterned hearts and flowers by Hero Arts onto three different pink cardstocks and cut them out. Working on the Mother's Day cards! I am entering this card into the Lily Pad Simon Says Stamp challenge of Flowers! I have a cute story to share. 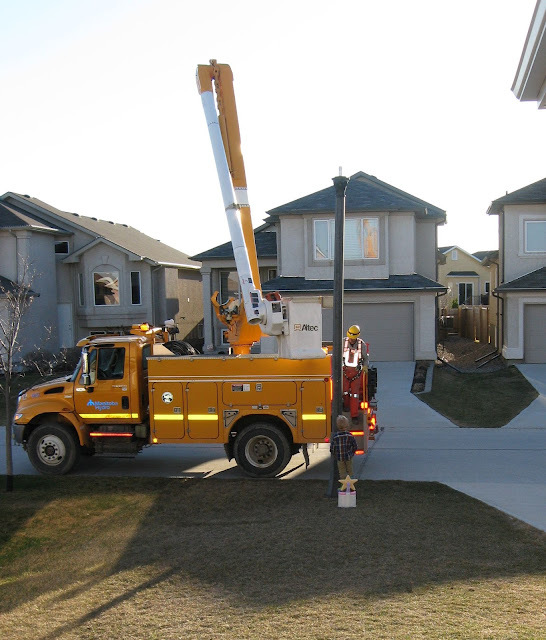 The other day the kids were playing outside and the door bell rang over and over and over. So I went and found Carter panting at the door and he runs inside and I ask him "Carter what's the matter?" He looks at me and says "Bee!!! There is a bee!" I tell him "Carter don't worry he won't eat you!" He says "Of course not I am not nectar!" He shocked me with that one! How does he know about nectar and bees? A few days later my MIL is babysitting him and there was a butterfly and he said to her "I don't want the butterfly to land on me!' And she said "Don't worry Carter the butterfly won't hurt you!" And he says "Yeah I am not nectar!" She was shocked and asked him how he knew that and he said to her "I just know!" Silly smart boy! I have another wreath to share! This one is for sale and if you are interested please email me! It's such fun and bright colors, perfect for this time of year! It's also my biggest wreath yet at 14 inches! Well I am off to make a tropical smoothie for us, study spelling and music homework with Ariel, and baths! Just typing that made me tired! Today I am home alone so I can have time to study! 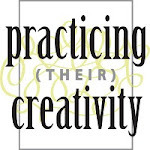 I am one of those people who need quiet to really learn and with two kids it isn't really quiet much! I've started my time alone not studying but a quick clean up of the house. In my defense you can't really study with a messy house right? Plus it's so much faster to clean when your all alone! Hello! I hope that you are having a fantastic day! This week has been amazing and one of the main reasons is all the beyond kind comments you have left me over my Stamping Royalty win! Wow I am so blown away by all of you! So blessed to have you part of my life! I actually have more exciting news. I am the first to admit that this past week has been really really great! My hubby is blown away too! It's funny how all the good things happen so closely together sometimes! I am excited to share that I have been asked to join the Gel a Tins design team! :> You can see the announcement here!! Can't wait to start working with there fabulous stamps! On Monday night I had 6 cards picked up for publication!!! 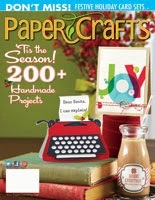 3 in the Create Stamping Idea book (September 2012) and 3 in CARDS September 2012 issue! This is the most for me that I have ever had picked up! It kinda was something I was hoping for but didn't want to get my hopes up! I have joy when I have 1 card picked up can you imagine how I feel having 6? Yowza indeed! The emails came one at a time while watching How I Met Your Mother and relaxing with Chad! It was 40 minutes of it and Chad kept saying "Another one? What? Really?" And high fiving me! It was awesome to share that with him! It has been a really blessed week!!!! Oh I wanted to share some more Easter photos. Chad and I have always left Easter bunnies and other chocolates for the kids from the Easter bunny. It might be because when Ariel was 3 I didn't buy her any chocolates from us. I figured she had gotten so much from family and she didn't need any more! Well 2 days later she asks Chad in the softest and sweetest voice "Daddy why didn't the Easter bunny come?" Oh boy did we mess up! Totally broke our hearts and he came the next morning! We do teach our kids the true meaning of Easter that Jesus died on the cross bearing of sins and saving us. But we have never had an Easter egg hunt at home for the kids! We always did it at Chad's parents and I guess that's why we didn't. On Good Friday I found out that Chad's siblings still do with there kids at home and it dawned on me why don't we do it too? So Chad took great joy in hiding chocolates all over the house late Saturday night!! He put there baskets on the door filled with there bunnies and made a trail from the door to the living room. Well at 1:30 in the morning on Sunday Carter wakes up and comes to us. He woke us up and we told him he needed to go back to bed, he said he wanted to go alone but I followed him because I worried he would be having a hunt in the middle of the night all by himself! As I follow him I see him realize that there are chocolate eggs on the floor! It was so sweet to watch his sleepy reaction! He said "Mommy the Easter bunny came! LOOK!" Well it took a little while to get him to go back to sleep! It was so fun to listen to Carter wake up Ariel in the morning with "Ariel the Easter bunny came!" And than hear there giggles and excitement as they hunted for eggs all over the house! On Saturday night we decorated eggs. This was the first year Carter really got into it and didn't break any eggs! The kids loved it. And loved eating them after they were all gone by Monday night! Well that's it from me! The house is quiet as Chad is out with his buddies and the kids are asleep! Time for me to hit the books and study! Even if the stamps are calling my name! Well my wonderful friends today I can finally share some amazing news! I am one of the winners for Paper Crafts Stamping Royalty 2012 contest in the Seasons Greetings category! You can see the announcement here on the Paper Crafts blog! To say that I am shocked would be putting it mildly! I can't believe it! I am so happy! At night I haven't been able to fall asleep easily since I am so excited! And when I wake up in the morning I smile instantly as I remember! Last year I didn't even enter as I didn't think I stood a chance! This year I told myself too bad like it or not your putting yourself out there so stamp stamping up and send it in! I worked on cards till the last day. I usually go to a Mom's group but I couldn't that day as Ariel was sick. While both kids were occupied with each other I stamped my last card, the winning card! Called up hubby up at work and begged him to go out and buy a bubble envelope and come home early so I could go to the post office in time! He asked me why this was so important and I told him that it was an amazing contest with a big prize. Even though I thought I stood no chance! I felt that hey I may as well try and if I don't win at least a great cause will get my cards! Since he is so great like that he did picked up what I needed and came home early! Last Monday when they were sending out the emails to the winners I happened to be online and than I got that special email from P.K. Smith and I just about fell off my chair! My stomach was full of butterflies!! I read it a few times and couldn't believe it! I screamed with joy (Carter told me I hurt his ears!) Jumped up and down! And called hubby up and told him all about it! He is so proud me!! He is excited about the big prize while I am more excited about the Tiara! As is Ariel! To her if mommy is a Queen she is a princess right? I know she will be begging me to wear the tiara! 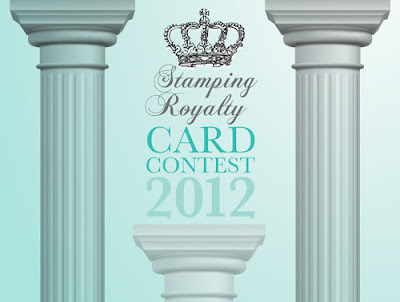 I love and am passionate about stamping and to win this contest is a true dream come true! 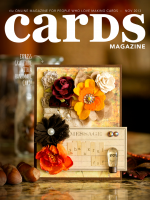 My card will be in the 2012 November/December issue so I can't share it! But I do have a thank you card that I made to share today. This is a thank you card for all the lovely people at Paper Crafts, for you my crafty friends, for my family for supporting me and this hobby!!! Thank you for being part of my life! Thank you so much for stopping by today and sharing in my excitement! Thank you to Paper Crafts for picking my card! :> And I wanted to say to my fellow winners, congratulations! I am so happy to be sharing in this with you! I can't wait to see your winning cards! And so happy to share this with my crafty friend Vera who won in the birthday category! What a dream come true! Isn't this stamp close to the flowers on the dress? I mimicked the belt with the bow on top. Not the best photo of this card I had to take the picture really quickly as we rushed to get out of the door on time! I am entering this card into A Blog Named Hero's challenge of Playing Favorites. I am sure your not surprised that this stamp is a favorite! Happy Thursday! Very much looking forward to this long weekend celebrating Easter! It's still absolutely beautiful outside and Carter and Ariel are playing together quite happily outside in the sunshine! I wanted to stop by and share a masculine card using my favorite masculine stamp Watch Gears. Since I'm using my favorite masculine stamp I am entering this card into A Blog Named Hero's challenge of playing favorites! I am also entering this card into the Simon Says Stamp challenge of Use your favorite tool! I did my heat gun of course! I recently discovered Claudine Hellmuth's sticky back canvas, well I should say rediscovered as I did take a class with her at Scrapfest that used the canvas! :> It's soo easy to stamp on. Heat embossing on it is a breeze and works just as well as paper! Distressed it with ink too and the edges! Today has been a nice relaxing day. Yesterday late afternoon the spring cleaning bug hit me and I went crazy cleaning up the house until I dropped. Finished up this morning. Carter and I enjoyed playing outside. I can see he is so much happier since it's nice out. He goes around and joins which ever kid is outside and plays with them! I think since he is young he doesn't get that he isn't always wanted! LOL Yesterday he played baseball with the neighbor kids and I heard the mom say "Okay it's Carter's turn to bat everyone go back!" And sure enough he can hit it far! He really excels at sports! I embossed the flowers in white and painted them with inks and water mixed with perfect pearls. I so enjoy this technique! Now that April is here I gotta focus on Mother's Day Cards! One of my favorites to make! I am entering this card into Lily Pad's Flower's Challenge! 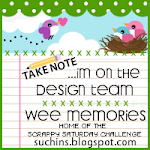 Love this challenge with all my new flower stamps I am entering it often! And this week's Simon Says stamp challenge of anything goes! Oh I do have one more funny tidbit for you, Carter's favorite thing to do on a schoolday is finish Ariel's lunch! He goes to her backpack digs it out and you hear him say with glee LUNCH LUNCH! Yes obviously it's because I don't feed him enough!!! It's healthy lunches today was a sandwich, strawberries, snowpeas, and dried apricots! Silly boy! Well I am off! Working with Ariel on music theory and practicing as she has a lesson tomorrow! Hello Happy Monday! Hope your week has had a great start mine really has! :> Dinner is the in the slowccoker a family favorite honey sesame chicken kids are watching a little after school/nap tv. For Ariel it's to wind down after school for Carter it's cause he's groggy and can be grumpy after naps! 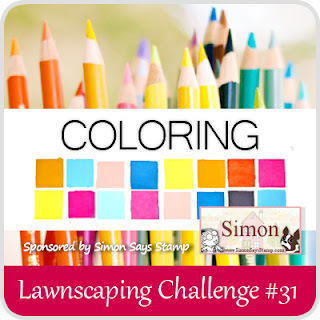 I am entering this card into Lawnscapping's newest challenge and simon says challenge anything goes! Not too much coloring but there is some! I love this set Critters Ever After! It's soooo cute and perfect for little girl cards! :> I colored the unicorn in with prisma pencils. By the way if you color with pencils what's your favorite ink to use? I find that Staz with clear stamps stick soo much! :> When I bought this paper I truly didn't think I would make a child's card with it, I usually use more bold colors for that but I love how this turned out! I love the bow I've had it in my mind for a while to do but it never worked out really until now! :> All I did was tie a bow tight and than used small pieces of adhesive to attach it and made ruffles the same way! :> Really makes it sooo girly! I wanted to share that I am on a smoothie craze right now! My favorite is the Green Monster Spinach Smoothie! I know spinach right? :> You seriously can't taste it! I also put kale in it and it's super good! Yesterday I made a Tropical smoothie and loved it!!!! I love coconut milk another new love! I also make a Banana Oatmeal Smoothie! I make it when the kids have leftover oatmeal and it's soo filling and so good with the almonds in it! :> My kids love it too and it's so healthy and an easy way to eat my fruits and veggies! They seem to drink anything if it's in a smoothie, I've even used cottage cheese in it! They eat a lot of fruits and veggies already but more doesn't hurt! Hope you have a fantastic week! I am off to finish up dinner!